At M&M, you experience the thrill of an actual hunt. You do not pay to have birds released before you arrive – the standard practice at most preserves. Instead, M&M releases thousands of young pheasants and partridge early in the season, allowing them to adapt to our fields and woodlands. Watching ducks trade over the horizon, waiting for the moment when they hear your call and wheel toward your decoys. Released mallard shoots at M&M are conducted over two large impoundments on the edge of a natural marsh. The action is fast and furious, offering pass shooting and some decoying shots. This shoot simulates European-style high driven bird shooting. If you enjoy pass shooting high-flying pheasants or partridge, you will love this shoot. Full Day Hunting Specials, Marsh & Field Hunt Combos, Our Dawn-till-Dusk Hunting Extravaganza, 1,000+ Mallard Release and Wingshooters Hunt! The Wingshooters Hunt is designed for groups of two or three hunters who want the most “bang for their buck.” This hunt is offered only on select dates throughout the year and sells out very quickly. Our lodge will also book very quickly during these dates, so be sure to reserve your room well in advance. Please visit our hunting and shooting calendar for dates. Includes: Half-day guided upland hunt with bag limit of 30 pheasant & partridge per group and guided released mallard shoot with Guaranteed harvest of 30 ducks per group. Yes. We can issue you a one-day preserve license if you bring an old license or a hunter safety card in your name from any state. You can also hunt at M&M if you have a current New Jersey hunting license. New Jersey also has an apprentice-hunting license for new hunters who have not completed a hunter safety course. To acquire a New Jersey apprentice hunting license use this link for more information: http://www.njfishandwildlife.com/hntlic_apprentice.htm. Also you can acquire a hunting license or hunter safety card from any state that is sufficient to issue you a one day license. How do I make a reservation? Do I need a deposit? Please call our office to book your hunt: (856) 935-1230. You will need a deposit to confirm your reservation. Do you have a youth rate or discount? At M&M, kids younger than 18 can hunt for free under the bag limit of two or more paying adults. Kids hunting free will be charged only for lodging and meals. If you would rather your child have his or her own bag limit, normal rates will apply. What should I wear? Do I need boots? Upland hunts: You are required to wear an orange hat and/or and orange vest. Generally, work boots or hiking boots are more than adequate, unless we have a lot of rain – then you may want a short rubber boot. Duck hunts: You will need a camouflage jacket or dull colors. Knee-high rubber boots are suggested for the Sunrise or Sunset Decoying Mallard Hunt. What type of ammo do I need for hunting and do you sell ammo? 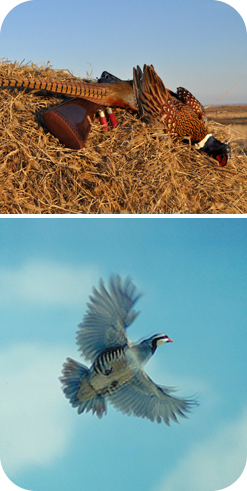 For upland bird hunting we suggest high-brass 7.5s or 6 shot. 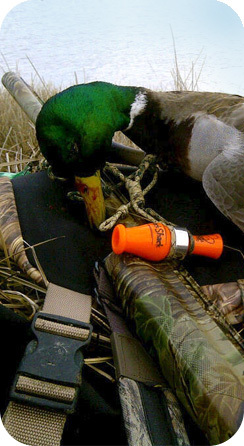 For ducks, you will need steel or other non-toxic shot. We suggest #2s or #4s. We sell ammunition and will have appropriate loads available. Notice: 10 gauge shotguns and 3.5-inch shells may not be used at M&M. What is a typical tip/gratuity for my guide? M&M’s professional guides rely on tips as part of their income. A typical gratuity is 15 to 20% of your hunting package fees. Can your staff process/clean the birds for me? Yes, we can send you home with processed frozen birds for a fee of $5 per bird. When does the hunting season start and end? The approximate dates of our hunting season at M&M are October 15 to late March, depending on bird populations. What time does my hunt start? Upland bird hunts start at 8:30 a.m. and 1 p.m. Mallard duck release hunts start at 9 a.m. and 1 p.m. Sunrise or Sunset Decoying Mallard Hunts will start a half-hour before sunrise for morning hunts and 2½ hours before sunset for evening hunts. Please arrive 30 minutes before your hunt to get checked in and complete any required licensing. A light rain is generally not an issue for any of the hunts. In the event of forecasted extreme weather, please contact the office the day before your hunt. The staff at M&M will make a ruling on the weather. There are lots of hunting preserves – what makes M&M different? There are many variables that differentiate M&M from your typical hunting preserve. Our staff takes pride in providing you with a great overall experience. M&M’s upland bird hunting and Sunrise or Sunset Decoying Mallard Hunts provide a “fair-chase” experience and thrill of the hunt that is unlike any other preserve. The options, amenities, and services provided at M&M are simply above and beyond what is available at most facilities. Yes! Try M&M Hunting Lodge or area hotels. For specific dates visit our hunting and shooting calendar.